To start with, Retail is proving to be an investment darling in flux. Fundamentals are stabilizing with vacancy rates at a 10 year low of around 4.75% and leasing demand continuing to outpace supply. This is especially true in the Southeast, where we can see the highest growth in demand while maintaining some of the lowest vacancy rates in the country. Orlando is in a class by itself after an increase in demand of almost 2% and a vacancy rate of just over 4%. Opportunities in Power Centers and in multi-tenant centers in secondary markets abound, as the total number of buyers in these asset types have dwindled substantially, decreasing competition and driving cap rates higher. Malls are continuing to become highly polarized, with vacancy rates at C class malls hovering around 8.5% while A class malls are around 2.75%. Rent growth is continuing to moderate, with asking rent growth up 2%, down from 3.5% in 2016. This is even more true in the Southeast, which has the highest rent growth in the country, with Orlando, Raleigh and Nashville leading the charge. Retail closures are almost double what they were in 2017, and investment activity has slowed to around $17B in Q1 of 2018, down from $25B a year earlier. In short, location continues to be king across all retail assets. The largest takeaway? Opportunity abounds in both retail and industrial investing. 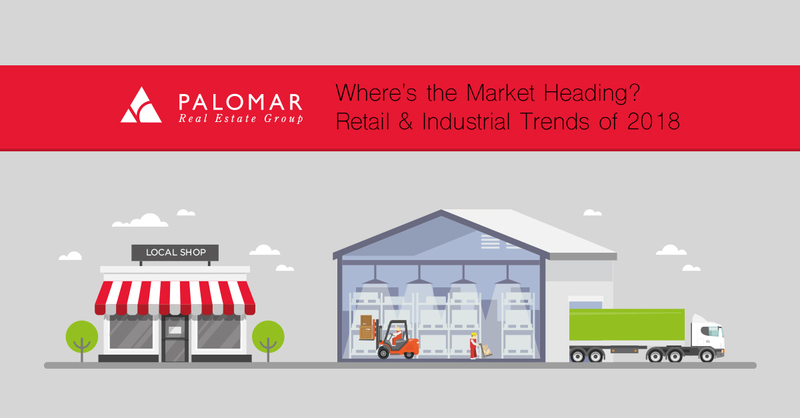 While The Palomar Group is continuing to see growth and pricing increases in the industrial markets, there may not be a better sector to find value in than retail this year. ​ Retail investors have started to flee to the sidelines, and this has presented significant opportunities in power centers, secondary market multi-tenant retail, and ​value add assets across all markets.